#7215 Smooshees Cuddler Companions "Judy Jupiter & Neptune The Dog"
Description: Blast off with the spacy Smooshees Cuddler Judy Jupiter and her Smooshee Companion Neptune the Smooshee Dog. Judy and Neptune were sold with a small spaceship that Judy and Neptune can be smooshed into. The set also includes a tiny anti-gravity jet pack, which is nearly impossible to find. The Smooshees are not marked with a model number, but they were sold with a sewn-on tag marked "Fisher-Price" and the trademark "S" for Smooshees. This set was designed for children ages 4 years and older. The sets pictured in the Fisher-Price dealer catalogues are pictured with accessories that are a bit different than the accessories that we have collected over the years. Below you will find the sets with accessories described as they were pictured in the catalogues. FPT16153 - Judy Jupiter - Female Smooshee astronaut with a stuffed cloth body and a printed face and clothes. She has hot pink fabric hair with pink printed hair on her forehead. She has blue printed eyes, a round red nose, pink cheeks, and a red line smile. Judy has a printed metallic silver space suit with 2 purple rings around her arms and legs, and multi-colored hoses and buttons on her chest. FPT16154 - Neptune - Smooshee dog with a stuffed cloth body and a pre-printed face and clothes. He has a metallic silver body and tail and long pink ears with purple inner ears. He has blue printed eyes, and a black nose and mouth with a red tongue hanging down. The top part of his face is pink, and the bottom part is white. FPT16155 - White spaceship with 2 white doors that pop open when the purple button on the back of the ship is pressed. The ship has a yellow seat inside, a clear plastic dome shaped nose, short white wings on the sides, and a purple removable rocket booster that snaps onto the back. The rocket booster doubles as part of the space doggie house by attached an accessory dome on top of it. FPT16156 - Purple rocket boosters that attach to the back of the space ship. When removed from the ship, the boosters can be laid flat to attach the accessory dome on top to become a space doggie house. FPT16157 - Clear plastic dome that attaches to the top of the rocket booster/dog house base. The dome has a molded circle on the top side. The bottom of the dome is open with a yellow plastic ring around the opening. FPT16158 - Small purple double-tank "anti-gravity" jet pack with an attached purple C-shaped hooks to attach to a Smooshees back. FPT16159 - Judy Jupiter - Female Smooshee astronaut with a stuffed cloth body and a printed face and clothes. She has light pink fabric hair with pink printed hair on her forehead. She has blue printed eyes, a round red nose, pink cheeks, and a red line smile. Judy has a white printed space suit with 2 purple rings around her arms and legs, and multi-colored hoses and buttons on her chest. *See "Variations" below. FPT16160 - Neptune - Smooshee dog with a stuffed cloth body and a pre-printed face and clothes. He has a white body and tail and long light pink ears with purple inner ears. He has purple printed eyes, and a purple nose and mouth with a pink tongue hanging down. The top part of his face is hot pink, and the bottom part is white. He has a purple printed collar around his neck, 2 purple rings around his tail, multi-colored buttons and gadgets on his left side, and a blue "S" Smooshee trademark symbol with a yellow ring around it printed on his right side. He also has purple pads on the bottom of his feet. *See "Variations" below. FPT16166 - Light purple spaceship with 2 clear plastic pink-tinted doors that pop open when the pink button on the back of the ship is pressed. The ship has a white seat inside, a clear plastic dome shaped nose, short wings on the sides, and a pink removable rocket booster that snaps onto the back. FPT16162 - Pink rocket boosters that attach to the back of the space ship. FPT16163 - Small pink double-tank "anti-gravity" jet pack with an attached pink C-shaped hooks to attach to a Smooshees back. The 1989 catalogue does not show the dome for the doggie house pictured in 1988. FPT16164 - Judy Jupiter - Female Smooshee astronaut with a stuffed cloth body and a printed face and clothes. She has hot pink fabric hair with pink printed hair on her forehead. She has blue printed eyes, a round red nose, pink cheeks, and a red line smile. 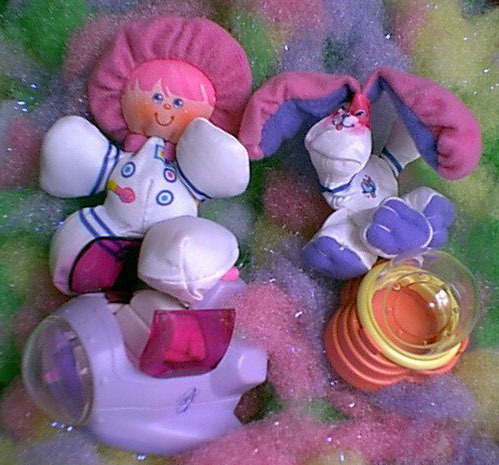 Judy has a white printed space suit with 2 purple rings around her arms and legs, and multi-colored hoses and buttons on her chest. FPT16165 - Neptune - Smooshee dog with a stuffed cloth body and a pre-printed face and clothes. He has a white body and tail and long hot pink ears with purple inner ears. He has purple printed eyes, and a purple nose and mouth with a pink tongue hanging down. The top part of his face is hot pink, and the bottom part is white. He has a purple printed collar around his neck, 2 purple rings around his tail, multi-colored buttons and gadgets on his left side, and a blue "S" Smooshee trademark symbol with a yellow ring around it printed on his right side. He also has purple pads on the bottom of his feet. FPT16167 - Small purple double-tank "anti-gravity" jet pack with an attached pink C-shaped hooks to attach to a Smooshees back. FPT16168 - The spaceship rocket booster has also been seen in orange. FP7215SET1988 - Complete set sold in a 13" long, 12-1/4" high, 3-1/8" deep display box. WFL: 07-AE-17-6-B.